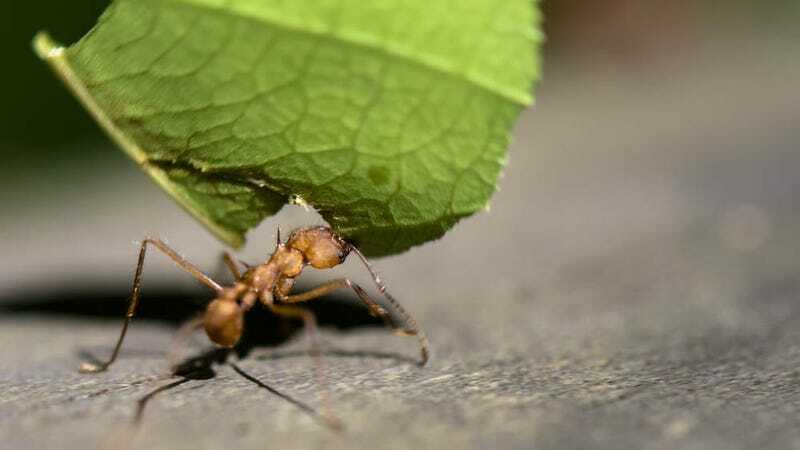 Leafcutter ants get their name because they use their incredibly sharp jaws to slice through leaves. Pretty straightforward stuff. Unfortunately for humans, those jaws can cut through other things, like fingers. So the host of Brave Wilderness decided to find out how much damage one could do in just 60 seconds. It doesn’t take long before the unprovoked ant starts tearing into this guy’s finger. A minute later he’s gushing blood from a bunch of brand new holes in his body. Even still, the damage looks nowhere near as bad as his encounter with a fire any colony, and he guesses bites from Paraponera clavata—another dickhead species of ant better known as the bullet ant—would probably hurt worse. Videos of astoundingly stupid stunts involving bullet ants would suggest he’s correct. Remember: this guy is a professional idiot. Getting maimed by animals isn’t worth it, no matter how badly you want YouTube subscribers.